Fault tolerance: HSRP design and implementation on Cisco routers, from start to finish. Building networks with fault tolerance in mind is one of the things that make you an experienced engineer. Service providers leverage on so many features available on network devices to create solutions that have the capacities to withstand disasters. One of such features is the Hot Standby Router Protocol, available on Cisco layer 3 devices. In this demonstration, I will share with us one of the real-live applications of HSRP on a network. further connected to the LAN switch via their f0/1 ports. Our objective is to implement HSRP on the LAN ports of the two routers so that connectivity to the ISP will remain intact even when there is a fault to one of the routers. 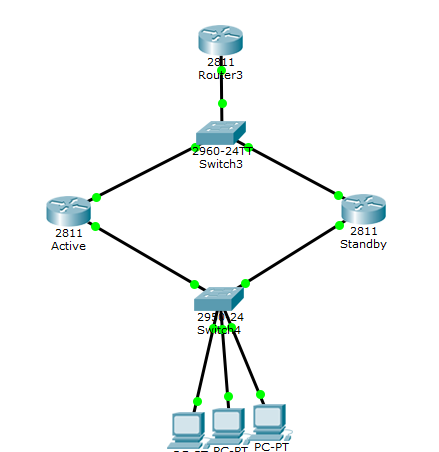 Requirements: at least a /29 public subnet, two Cisco HSRP-enabled routers, two switches. Note: I used the “public” IP on each router as its nat pool. This makes it possible for the ISP router to know where the traffics are coming from and effectively reply accordingly. On the local computers, assign IP addresses from the 192.168.2.0 starting from 192.168.2.4 with gateway being 192.168.2.4 -the IP address of the active HSRP router. Test: to test this, run a ping to the IP address on the ISP router after that, shut down the active hsrp router and repeat the process. If implemented correctly, the pings should be successful. Cisco CCNA: Powering on Cisco routers. Boot process explained, from start to finish. Network Address Translation (NAT) configuration on a Cisco router, from start to finish.